Cost: $350+HST includes manual and certification fee. 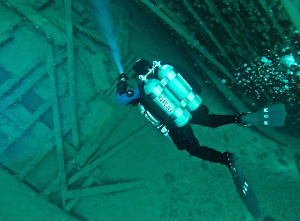 Shipwreck diving is one of the most unique, enjoyable and diverse types of diving available, and being here in the Great Lakes region, we have more shipwrecks that are awaiting your exploration than virtually anywhere else in the world! Each wreck dive offers a chance for discovery, potentially unlocking a mystery or spotting something others have missed. The PADI Wreck Diver Specialty course is popular because it offers rewarding adventures while observing responsible wreck diving practices. If you’re at least 15 years old and have earned a PADI Advanced Open Water certification or higher, you can enroll in our Wreck Diver Specialty course. $350+HST includes manual and certification fee. Get a PADI Wreck Diver Manual and Wreck Diving video from our store when you enroll in the course. Read the manual and watch the video before meeting with your PADI Instructor to discuss the wrecks you’ll visit during your open water scuba dives. You’ll need your basic scuba equipment configured with a DIR hose kit to streamline your regulator hoses, a primary and backup dive light, an underwater notebook, a wrist compass for mapping and navigation, and a primary reel, a backup spool and at least one surface marker buoy. If you plan to engage in wreck penetrations double tanks or sidemounted tanks are required, as is pre-certification in Intro to Tech. Feel free to contact us for more details. Want to know more about PADI Wreck Diver Course?